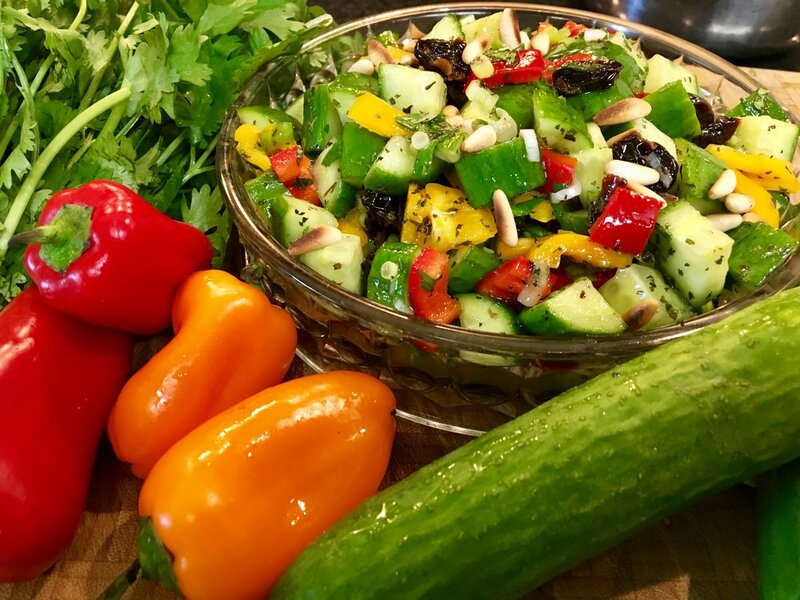 Salad Shirazi is one of my favorite Persian salads. Recently I made homemade falafel for a client and thought a nice quick salad would be great to accompany the falafel. I had all the ingredients for Shirazi, plus a few extras, and threw them all together. The result was fresh, sweet, tart, and delicious! I hope you love this salad as much as we did. Prep the cucumber, peppers, and tomatoes. Place in a nonmetal mixing bowl. In a separate bowl whisk together the vinegar, oil, agave nectar, and dried mint. Taste the dressing for seasoning and add Cook’s Line or salt and pepper to taste. Drain the plumped cherries from the water and add to the salad. Pour the dressing over the salad and toss/coat. Chill and allow the flavors to combine in the fridge for 20 minutes. Before serving sprinkle on the toasted pine nuts and toss in.